Scripting Tracker is a utility and a replacement to the SAP® GUI Scripting Development Tools. 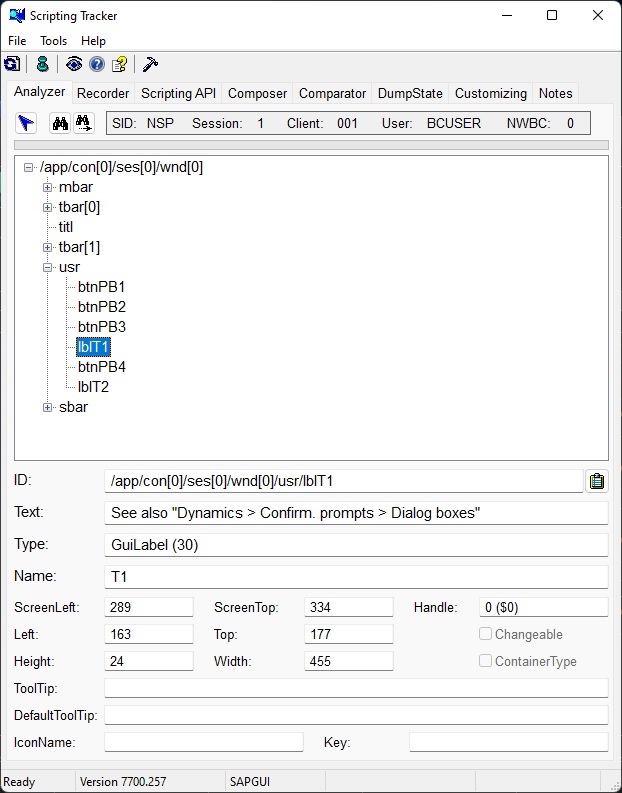 It is a SAP® GUI analyser, comparator, recorder on SAP® GUI Scripting base and a SAP® GUI Scripting API viewer. 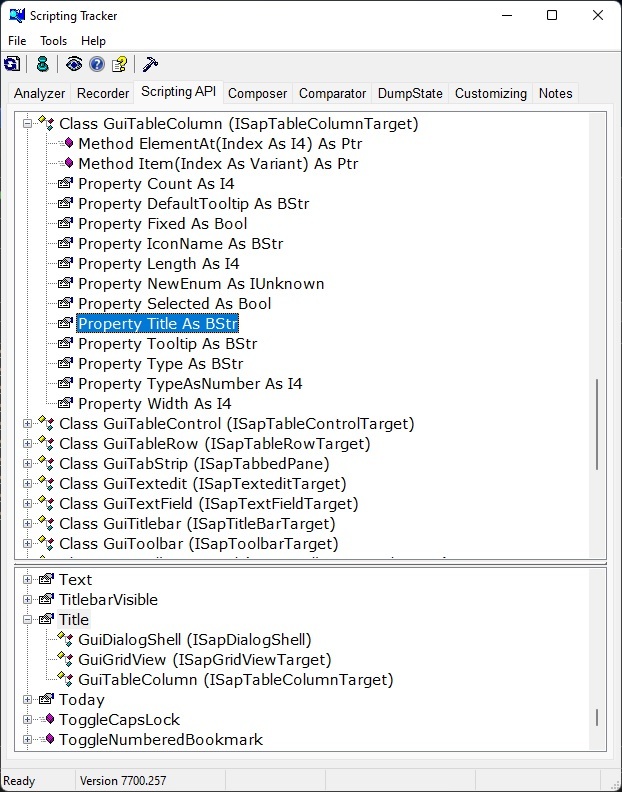 The program shows a clearly arranged tree with all SAP® sessions and its scripting objects. Also it shows for each scripting object, after the selection in the tree with a single mouse click, a lot of technical details like e.g. ID, position etc. etc. etc. With the Analyser the program offers the possibility to identify each scripting object with a red frame. It is possible on the one hand to select an object from the hierarchy tree and to press the right mouse button. On the other hand it is possible to select a session from the hierarchy tree and to press the identify button. Now it is necessary to move the mouse pointer to the selected session window. This functionality is equal to the SAP® GUI Scripting wizard. After the identifying of the scripting object it is possible to copy its technical name, called ID, to the clipboard and to use them in another context. And you can search inside the the SAP® GUI Scripting object hierarchy via ID, text, type, name and tooltips to find a scripting object fast. The DumpState delivers a hierarchy of collections with information about the state of an object. With the Comparator you can compare screen elements of different screens to find differences. With the Recorder the program offers the possibility to record, edit and execute your SAP® GUI activities in PowerShell®, Visual Basic® on Windows® Scripting Host or AutoIt script. The recorder includes a basic editor to load, edit and execute SAP® GUI scripts. Also it is possible to record activties in Python. 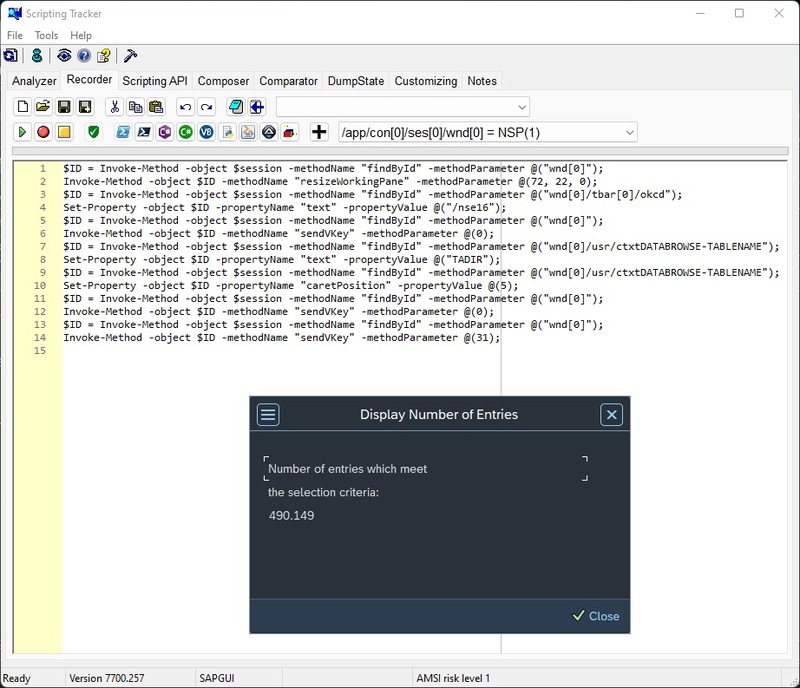 The Scripting API viewer shows the complete SAP® GUI Scripting API in an organized tree, analogous to the SAP® GUI Scripting API help file. It is possible with a double click to copy the signature in the clipboard to use it in your code. Also it shows the methods and properties vis-à-vis, this means you can find a method or property and the classes where they are available. You can use Scripting Tracker with SAP® GUI for Windows® and SAP® NetWeaver® Business Client (NWBC) for Desktop. 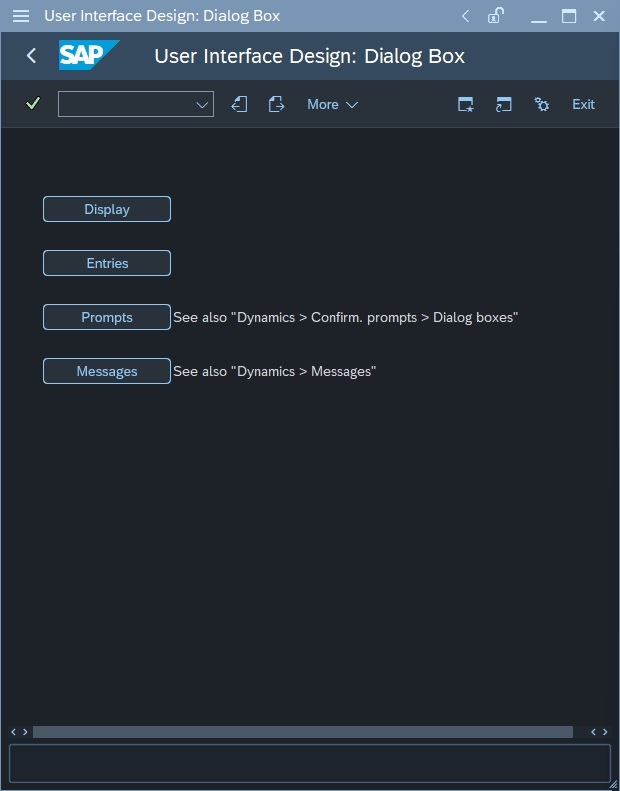 Hints: Scripting Tracker uses SAP® GUI Scripting engine. So it is necessary to enable SAP® GUI Scripting on the application and presentation server. Use the transaction code RZ11 to activate the scripting on the application server and the option menu from SAP® Logon or SAP® GUI for Windows®. If the SAP® GUI Scripting is disable on one application server, you can not see its sessions.